Our church has an active youth group, which I am fortunate to work with on a weekly basis. On Tuesday, we are staging our end of year event which highlights specific things the girls have learned and projects they have completed. It's a big deal. The current president of this organization is an incredible woman who can do everything from baking her own bread to sewing beautifully without a pattern, and everything both crafty and practical in between. At one point in her life, she decorated and arranged flowers for weddings. So, when we made our plans to have bouquets for the girls and various tablecloths, drapings and arrangements, we were really excited at how fabulous it would all be. Then, Cathy had to leave town for an unexpected emergency. Imagine my surprise when I ended up on the hook for 23 bouquets. By tomorrow. Wait! I've never once in my life arranged flowers. And, the flowers aren't supposed to be here until 10:30 am tomorrow. So, in full panic mode, about 7pm I went to Costco and purchased a variety of things in order to make as many bouquets as it took to get them right. I have never missed my sister Marnie more than I missed her as I walked out of Costco with all of the supplies and zero clue as to what I was going to do with them. Marnie can take anything and make it beautiful. She did all of the flowers for my wedding, all of the centerpieces, baked and decorated the cake, and on and on and on. She whips up displays and centerpieces the way I whip up brownies and cupcakes (which could explain the clothing size differences, but I will leave that for another blog). I learned two things tonight. 1) Prayers are answered. The above picture is my first attempt at the flowers and I am fully convinced I was channeling Marnie in order to do that, so thanks sis! 2) I never thanked Marnie enough for the awesome job she did. I had no idea what it really takes to make beautiful things appear like magic. So, THANK YOU! 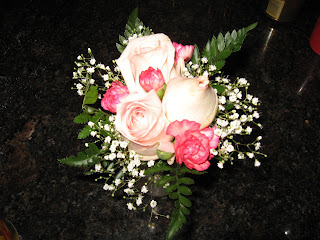 The flowers look beautiful and I think I teared up a little while reading this blog. You rock. The bouquet looks looks great. See how crafty you are?